These objects in my shadow box represent my counter narrative and how they cancel out the dominant narratives or stereotypes. When people see me the first time they might think about me is that I am very poor and not normal and a bad immigrant with bad grades. They only see that in me because those are the stereotypes that people put on Mexicans. But that is because that’s how they see me on the outside but if they really know me on the inside and outside I am a very good nice person who is very hard working and like all hard working like all Mexicans. My Shadow B ox cancels off all those dominant narratives and places it with what I really am. The Mexico and USA flag represent how I am proud of my nationalities and they make who I am. Also the Lamborghini represents how people say things like “Mexicans are poor” or “Mexicans don’t have money” but this Lamborghini proves that Mexicans can too be rich and also I am going to work very hard to have money and get my family out the poor. The dog on my Shadow Box represents my love for dogs especially a German Shepard because they are a man’s best friend. The artist on my Shadow Boxes called Lil Pump and this shows my love for music and how it makes me feel good especially mumble rap. Also the A+ and the soccer ball connected mean that I play alot of sports especially soccer hat I love and I still get my work done and have good grades when people say the opposite.The respect women image have a meaning, so people say that men don’t respect women but the image says that I have a lot of respect for women and believe that they should be treated the same. Just because I am male which is my gender identity and gender expression. I want the stereotypes for all Mexicans go away and for everyone to just be treated with respect. My Identities of Myself by Manuel Mercado by Manuel is licensed under a Creative Commons Attribution-ShareAlike 4.0 International License. Hi Manuel, your writing is beautiful and inspiring. I think it is very difficult for Mexican-Americans to fight the harsh stereotypes that face them in everyday life. Your determination and will to work hard will serve you well and I can tell you are a very kind personality. I am hopeful that some day other people will not see this race as lazy because they are the ones who contribute immensely to our economy and society. If you would like to read more on this topic, I suggest you look over this article: http://www.latimes.com/local/california/la-me-hispanic-heritage-month-mexican-and-american-1475880324-htmlstory.html. I look forward to reading more from you on this topic in the future and I wish you the very best of luck in your endeavors! 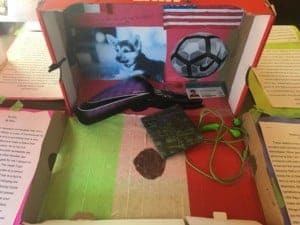 Your shadowbox stood out to me because of how you have your earbuds inside. Showing us that you like music, I like music too! The picture of the dog also stands out to me because I love animals. I am looking foward for more of your work. The quote that stood out to me was “The Mexico and USA flag represent how I am proud of my nationalities and they make who I am.” Although you were being stereotyped as a Mexican person, it’s very aspiring to see that you also acknowledge your nationality as an American. I also loved how you included what your interests were and how you explained them with the dog and sports.